Hunger doesn’t take the weekend off. You can make a difference to children who go home from school on Friday with no food for the weekend. You Shop. Amazon Gives. Another way to help feed children in your community! 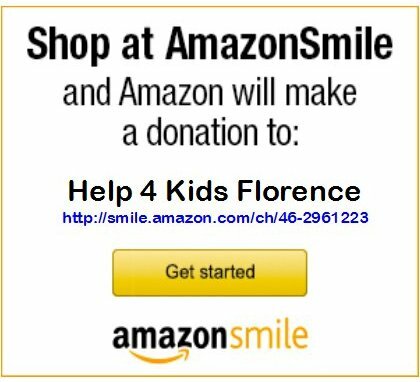 Amazon will donate 0.5% of the price of your eligible AmazonSmile purchases to Help 4 Kids Florence whenever you shop on AmazonSmile. Donate food or hold a food drive at your church or organization for single-serve items such as; Ramen Noodles, Applesauce, Fruit Cups, Pop Tarts, or Pop top cans of Ravioli, Spaghetti, Vienna Sausages, and Beanie Weenies. Food can be dropped off at the CSP Insurance Services Building located at 2414 Hoffmeyer Monday through Friday 9:00 am. – 5:00 pm. For large donation or to schedule a pick up please call 843-580-4111. Help us get information out to the community about the Help 4 Kids Florence organization. * Help our organization through volunteerism and in-kind sponsorship and donations. Help 4 Kids Florence is a 501c3 non-profit organization developed in 2013 as a community outreach program to feed hungry children in Florence County. During the school year pre-packaged, self-serving nutritious food is given to each child to take home for the weekend, these children attend elementary schools in the Florence School District who are at risk for hunger. Children are identified by their school teachers and administratrors as at-risk and parents are asked to sign a permission form. *$10 provides a meal for one child for four weekends. $100 provides a meal for one child for each weekend of the academic year. This provides each child a bag of food each week during the school year that consists of single-serve items such as Ramen Noodles, Applesauce, Vienna Sausage, Pop Tarts, Bennie Weenies, Oatmeal, Grits and Spaghetti & Meatballs. During our 5th year of operation, Academic Year 2017-2018, Help 4 Kids Florence has been providing approximately 2,200 bags of food each weekend among 33 schools (including seven Head Start programs) in all five Florence County School Districts (Florence, Pamplico, Lake City, Timmonsville and Johnsonville).